Step right up, folks! Witness the stupendous, astounding, incomprehensibly incomprehensible, Freak Animal Mutations Only a Baker Could Create! The crappily conjoined cupcake kitties! Well it looks like a frog, but I detect some monkey business. "Walk the dog"? Looks more like "Scrape the Sidewalk." Oh, but first, remember that kiddy song "Do Your Ears Hang Low?" "Dude, I used to have nightmares about a turtle that looked exactly like this when I was little." "But that was a long time ago. How can you be sure?" Thanks to Wreckporters Sarah P., Melissa T., Meredith, Kristin C., & Ed P.! I have no trouble saying that three times fast. Note to self: do not attempt to eat cereal while reading CakeWrecks. The best thing about the tiger is the extra cupcake/ paw print off to the side! Those green things are turtles? Are you sure??? Turtles? I thought those were possessed radioactive beehives! "Turtle recall" - that's awesome. I figured you'd go with "those blobs look returtled." Or maybe "these put the turd in turtle!" "Turtle recall" is so bad I wish I'd thought of it. OK so I got through the whole post with my 22 month son looking at the pictures, but when we got to the poo-turtles he just pointed and kept going "uu-uuu-uuu". Even he thought they were incomprehensible. Doesn't bode well, now does it? Do people actually BUY these??? OMG that last joke actually made me laugh out loud. My daughter even looked at me funny. Turtle recall...hehehehehhe. Are you sure those are supposed to be turtles? Yeah, I think I have to agree. The turtles are definitely the scariest things on there. Holy crap! Are we even sure those aren't flesh-eating aliens? You made me groan with the Turtle Recall. And my eyes are now hurting from the wreckage. My 3 year old son just asked me "What are those green things by the tiger". Turtle schmurtle I say! Thanks! Now I have the "ears hang low" song stuck in my head! maybe the first picture is showing the inner desire of the baker for some fuzzy slippers for Christmas??? Not related to this post, but you might be interested to know that Amazon shipped pre-orders of your book in the Uk today. "It's not easy being brown..."
Those so-called turtles look like piles of alien poop. With faces. Animals on crack. Look at the dogs eye! I actually groaned aloud. :) Loved it tho. My 5 year old said the the "turtles" were "probably aliens." That brown monkey frog thing... it's supposed to be a monkey? Because it took me a good 2 minutes to realize it wasn't a brown frog with something stuck on it's head. The bananas gave it away. WV: Terma. As in, these wreckerators should be terma-nated from their current positions. My 5 year old saw the picture of the turtles and said, "ALIENS!" Those "kitties" look like old (and I mean, very old) slippers. Those "turtles" look like poo piles. Very sick poo piles! Those are turtles?? They look like aliens! Or maybe they are turtles made of alien poo?? Ok, I like to challenge myself to identify the cakes before reading the commentary, then I go back and read it all. I had absolutely no idea those were supposed to be turtles...That is a pretty amazing wreck. I think the special effects department of the BBC who deal with making props for Dr Who would be interested to see that last photo . . . . or maybe they check in here every now and then to get new ideas for their freaky alien characters . . . I thought that first set of cupcakes was supposed to be a pair of bunny slippers. Maybe a pair of bunny slippers made of poo, but still. As for the turtles, if you hadn't told me that was what they were, I would not have guessed "turtle" myself. Nuclear Plants After the Meltdown would have been my first guess. Kid: Daddy, I want Teenage Mutant Ninja Turtles! OMG! That first one looks like two kitties peeking out from under a pile a of poo! The the tiger one looks like he has those hipster ear-plug thingies. Then, man it just gets weirder and scarier from there. 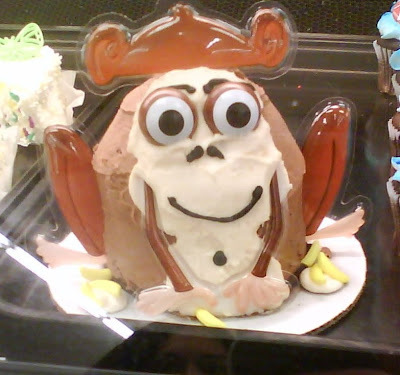 I am amazed at the never-ending selection of terrifying cakes offered up for real hard-earned cash. that frog monkey cake scare the hell out of me...really it looks like it would be squatiing on some level of Dante's inferno. Do people actually buy this crap? The "cats" look like poorly made slippers. Frogs are amphibians and rarely have belly buttons or eyebrows, but they are all about rocking the matador hats, so I'm not sure what that one is supposed to be. The dog could be from the old "Davey and Golieth" cartoon, if it weren't so swirly - and I do mean swirly! I would so order the Tony the Tiger splat; it's hilarious! I won't even try to top turtle recall. It just can't be done. You are the Pun-Master! WV: bechec - Are these cakes wrecks? You bechec! They're not "turtles," they're "TURDLES"!!! I thought the 1st one was a 2-headed racoon. Still can't get my head around the fact people are supposed to BUY these poor rejects from The Island of Dr. Moreau! did...did those two sumo-turtlebots kill mini blue Santa???? The last one reminds me of something I would of found in my lil girls diaper a few years ago as for the "Frokey" (frog monkey) my lil girl loved it. I think they're the turtle-like aliens from The Fifth Element, the Mondoshawan. Is there any cake under the mound of turtle frosting? EWWW! Those siamese kitties make me want to diet. Those looks like cakes I would make. Oh, poor kitties! Not only do they have heads too small in proportion to their bodies, but their bodies are covered in poo! Something unfortunate happen in the litter box? Poor kitties. Thanks for the morning spit take, guys! I think the Monkey/Frog is actually a Mr.Potato Head with well... bananas on the bottom. Come on, the hat, ears and eyes. Anyone??? 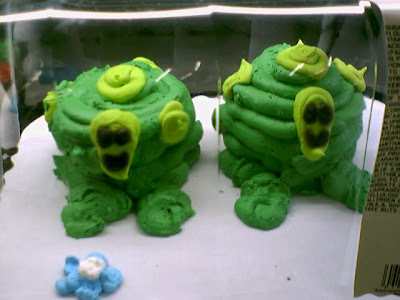 The green blob cupcakes remind me of the Mondoshawans from Fifth Element. Love the bad puns. (Turtle Recall - rofl). Just like in the old Dilbert cartoons before he focused solely on office life. 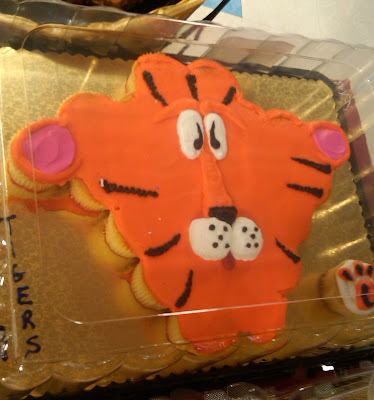 I hypothesize that on the tiger cake the Team Mom (I'm assuming this is for some sort of child's team) ordered a certain number of cupcakes (say, 20) and that the bakery couldn't possibly cram another cupcake into that crazy tiger head. So they added one to the side to complete the order. Please excuse me, I just spent an inordinate amount of time wondering why there was a random cupcake off to the side on the tiger cake and this is what I came up with. Had to share. Yikes. I got nothing else. I agree with the others. Turtles do indeed look like poo piles. I was reminded of this time when my son (he was about 1 at the time) had too many of those green freezer pops (his grandmother did it). I'm not sure these are turtles. They look like the weird aliens from "The 5th Element" or the ones from "The Hitchhikers Guide to the Galaxy!" Re: the joke at the end of this post. Jen, you're so hilarious! I heart you. Those turtles sort look like squished schleestacks from Land of the Lost, the 70's version. 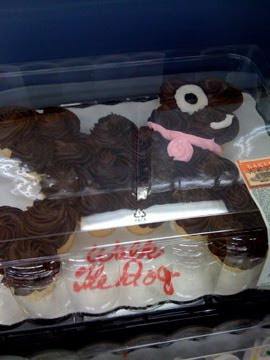 The Walk the Dog "cake" looks like a turtle head morphed on to some sort of hobbyhorse body. I love turtles, but not these! Oh my. I very nearly snorted Root Beer out my nose while reading this post. It was a close thing. God, those cupcake creatures are horrifying and yet so hilarious. The cats scare me (run faaaar away! ), but the tiger made me laugh. It's not so "grrrrreat!" And I forgot about the dog. The dog looks...I dunno. I wouldn't want to be in a dark room with a dog that has crazy eyes like that. Nor a frog/monkey thing. "Mommy, the eyes are following me!!" These are more wrecky than usual--and that's saying something! No, that last one looks like the spawn of the Michelin man and the Incredible Hulk. Not that's a hook-up. Do you welly think so? I welly do. Those "turtles" look a little like the the "turd" the older brother, Chet, got turned into in the movie Weird Science!! Sorry for being off-topic (the pictures have rendered me quite speechless), just wanted to tell that your book has been delivered to my home in Germany today and we LOVE it! No. No. No. The AWFUL (snort) pun-opportunity aside, surely those green blobs were sent to remind us to Wash Our Hands. They are clearly GERMS from the heretofore unknown Turtle-Flu virus. So you turtle-ly need to remember to take your vitamins and get plenty of rest..... Especially you, John. Splorp! What's that, Cake Decorator Person? Oh... Let's call it a turtle. Are those "turtles", cupcakes covered in green poo, I mean frosting? Maybe they've never seen a turtle? "Well, they're green. And round. And... that's about it." Why don't they just start making entire cakes out of frosting? Sheesh. My 11 year old son thinks the punchline on the last cake should say,"Turdle Recall". i laughed out loud when i saw the turtle faces. I have never seen "cupcake cakes" in real life...who? why? what were they thinking? You heartless people, have none of you noticed!? That poor monkey, his arms are coming out of his FACE! 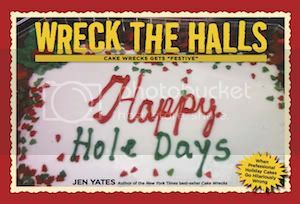 Oh, the horror those wreckerators inflict on poor, unsuspecting animal cakes. I kind of like the tiger. OMG that monkey thing scared me as I scrolled past quickly by mistake. It was a like mask of horror flashing on my screen. There is no excuse for not thinking twice before you break out the brown icing, people! Does everybody notice the conjoint cat twins, who have been run over, the heads-neither of them- match the colour of the body. Not even if you mashed the head colours together would you get that colour. As a cat lover I am appalled. Now the monkey frog. I'm not going to go on about its shape. I AM however going to ask if the gel things for arms and above the head are bath gel which often comes like that...not in that colour though. I'm not even going to comment on the dog which seems to have been pieced together from petrified poop in an effort to recreate some semblance of a malformed bear, kept as a pet dog. The tiger looks like it was once a tiger rug, was spewed on by some fluoro paint eating kid and then steam rolled. What HAS the baker been eating? I think the swirly-ness to the green should have us ALL worried. A whole post on that would be great!!! I know you've read it before but "Turtle Recall" ha ha ha! My 3 year old said the frog was a monkey and just look confused at the turtles and said "What is it Mama??" I am in pain, and it's not punny. I can't figure out why The Evil Empire insists on using the poo-tube for all of their cupcake and cupcake-like items. I mean, I get the ease, but for the love of cake, use a star tip! I think the "Walk the Dog" one isn't actually a dog, but is actually a warning of what will happen on your floor if you forget to do just that. DAMN! How'd you know those were turtles?!?! it's like green poo with ghost faces...how could they let this happen?!? Oh man, those turtle things are creepy! Thank you for making me smile when I didn't want to. Oh, turtles - I see it now. Wait - no I don't. which makes it all the more disturbing. Turtle recall! That pun was so bad, it caused me physical pain. That "tiger" ccc reminded me of that part from the movie Drop Dead Fred where Fred's head got stuck in the refrigerator...does anyone else remember it? That tiger looks like they used a UTERUS mold and colored it orange. So VERY wrong. Okay! I laughed until I snorted! How embarrassing! That is seriously the funniest thing I've heard all week. those green things ... are they going to start reciting bad poetry soon? The top one looks like poo-slippers and the last one looks like what happens when I eat corn. 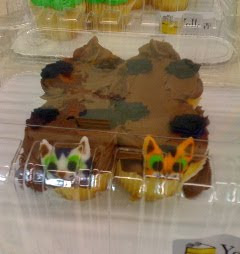 Crappily conjoined cupcake kitties--there's no way you can read that aloud and not laugh. Is it bad that I saw those turtles and automatically saw a World of Warcraft character? ah- what is coming out of the side of the monkey-frog? looks a little...YIKES!